Kanya Clarke and Norma Hunter. Boston Tennis Club ladies’ annual tennis day was held last Thursday, with 56 players from across the county taking part. Sweltering conditions made the competition tough and there were some closely contested groups. The event was broken up into four groups of players. Seven pairs in each group played eight games against each of the other pairs in their group in this round robin stage. The group winners were Edwina Jackson and Helen Dunning (Louth), Liz Isles and Kathryn Garment (Grantham), Liz Williams and Sarah Chappell (Bourne), Norma Hunter and Kanya Clark (Boston). The day concluded with a delicious buffet provided by Linda Beswick and her team. The event was organised by Lesley Addy. It was a disappointing weekend for two Boston men’s teams competing in the Dunlop Lindum Lincolnshire Doubles League. Both Boston Fifths and Sixths compete in Division 3B, with Boston Fifths playing Bourne Seconds and Boston Sixths up against David Lloyd Burton Waters. Bourne beat Boston Fifths, 4-2. In this game, Boston were represented by Daniel Scott, Trent Hutson, Matthew Cheer, Zafar Khan and Nic Hart. 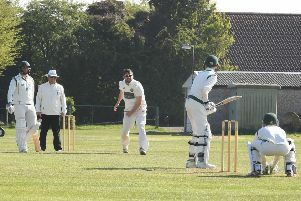 Boston Sixths lost out to Burton Waters Thirds. They went down down 1-5 in this contest. Playing for Boston Sixths on this occasion were Robert Bonser, Richard Woods, Zach McDonnell-Woods, Sev Smura, Toby McDonnell-Woods and Terry Mastin.